Blog - Chi Hack Night - Chicago's weekly event to build, share, and learn about civic tech. We announced in November 2018 that after almost 7 years and 300 events, Chi Hack Night was forming as a non-profit. Since then, we’ve been hard at work behind the scenes forming our new organization. Today, we are excited to announce a major step on that journey: our first Board of Directors! Chi Hack Night is proud to present our second annual Black History Month Speaker Series. This year’s speaker series will consist of 3 Chi Hack Night presentations on Tuesday nights in February and a partnership event with the Chicago Chapter of The National Association of Black Journalists. Chi Hack Night is incorporating as a non-profit! In December 2018, Chi Hack Night will incorporate as an independent, membership-driven 501(c)3 non-profit organization. We will invite attendees to become voting members and elect who will serve on our Board of Directors. And on December 11th, we will hold a town hall feedback session about these changes at Chi Hack Night. On May 8th, 2018 we celebrated the 300th episode of Chi Hack Night! In honor of this momentous milestone, we recognized the many people, projects, partners, and presentations that make our community great. The evening included the awarding of “the Hackies”, our new civic tech version of the Oscars! 13 Hackies were awarded by popular vote. On March 10, 2018, a cadre of journalists, civic tech folks, and other interested people gathered in a room at the Marriott Magnificent Mile to discuss the relationship of civic tech and data journalism. Derek Eder and I were to facilitate the discussion at this session, which was called “Civic Tech and Data Journalism: Better Together.” We didn’t include a period on the end of the title, but for us it was implied – it was a statement of fact. However, we soon found, just minutes into the discussion, that, for many in the group, the title should have ended in a question mark. This guide is for people who are concerned about use of their data by social media platforms like Facebook, Twitter, Instagram, Snapchat and Google and its effect on themselves and the world. Though Facebook is emphasized in the guide, most of these steps and principles can be applied to just about any web platform. Chi Hack Night, representing Chicago’s civic technology community, invites every candidate for Attorney General of Illinois to sign a pledge to, if elected, commit their office to an open data policy and practice. Jumping off from the success of our Black History Month Speaker Series in February, for the month of March, we will celebrate Women’s History Month at Chi Hack Night featuring presentations from Alya Adamany Woods from ChicagoNEXT, Sana Jafri from Chicago Learning Exchange, Vicki White from Chicago Books to Women in Prison and Michelle Frisque the CTO of Chicago Public Libraries. We hope you will join us! For the month of February, we will celebrate Black History Month at Chi Hack Night featuring presentations from Alvyn Walker from Leave No Veteran Behind, Cook County State’s Attorney Kim Foxx, Fabian Elliott of Black Tech Mecca, Charlene Carruthers of BYP100 and Colony 5. We hope you will join us! 48 events. 35 presentations. 4 satellite events. 15 new co-hosts. 1 open data pledge. And much more! This is the Chi Hack Night 2017 Year in Review! Chi Hack Night, representing Chicago’s civic technology community, invites every candidate for Governor of Illinois to sign a pledge to, if elected, commit their office to an open data policy and practice. Chicago’s Clear Water Project is an effort to keep beaches safe through a combination of new water testing technologies, predictive modeling, and continued volunteer engagement. Based on its pilot run in 2017, the Clear Water Project method was able to issue water quality advisories with three times more accuracy than Chicago’s previous method. For our 250th hack night, we asked for presentations along the theme of 5 years forward / 5 years back. We also wanted to open up the format a bit and encourage other kinds of performances, including talks, poems, songs and skits. Working in newspapers was an education in civics, and in hacking. Chi Hack Night helped me put the two together. As Chi Hack Night marks its 5th anniversary this week, its role in Chicago’s tech community and civic life , and I’m personally grateful for its endurance. Today marks Chi Hack Night’s 250th event and 5 year anniversary! Yes, we’ve been doing this for 5 years, and what a ride it’s been! For the occasion, we invited our members, alumni and past presenters to share how Chi Hack Night and it’s community has affected or benefited them. We were floored by your responses. It turns out you like us! You really like us! Celebrate 5 Years of Chi Hack Night with Us! April 18, 2017 will mark the 250th episode of Chi Hack Night. That’s 5 years! To celebrate this day, we want to hear from you, the members of Chi Hack Night, via lightning presentations and testimonials. As members of Chi Hack Night, an open group that has been shaping civic technology in Chicago for five years, we responded to Scott Moorhouse’s opinion piece suggesting a hackathon to solve Chicago’s violence problem. Smart Chicago Collaborative and Chi Hack Night have teamed up to create a speaking series in celebration of Women’s History Month in an effort to elevate the talented, diverse women in civic-driven technology across Chicago. 49 events. 33 presentations. 27 blog posts. 2 open data pledges 58 video presentations. And much more! This is the Chi Hack Night 2016 Year in Review! On December 13th 2016, Chi Hack Night hosted our last event of the year: The Chi Hack Night Holiday Party Hacktacular. Eight members of the Chi Hack Night community shared their own story or insight about civics, society and technology. The major themes this time around were the needs, tactics and benefits of inclusion, perspective on our community’s role in society, and the responsibilities that we have as users of data. Lightning Talks return for our last Chi Hack Night of the year! Do you have an interesting or funny story to tell about civics, society and/or technology? Want to show off that awesome project you’ve been working on? Now’s your chance to tell it to the world! On November 15, 2016, Chi Hack Night held a post-election community feedback session. It was our largest Chi Hack Night ever with over 165 attendees. Read through the full results and see how our community is planning to adapt to America’s new political reality. Oct 14-15, 2016 was Transparency Camp in Cleveland, Ohio - and Chi Hack Night was there to represent Chicago! As advocates of transparency and open government, it’s only natural that members of Chi Hack Night decided to attend. With Cleveland a 5-6 hour drive away, we decided to make a road trip out of it! We rented a van and hit the road. On Tuesday, September 13th 2016, three analysts from the United States Government Accountability Office presented at Chi Hack Night to describe the data-intensive nature of their work assessing our federal government’s efficiency to a crowd of over 100 people. Presenters Rebecca Abela, Silvia Ellis, and Joanie Lofgren all work in the GAO’s Chicago office, one of 11 offices across the country. This Fall, Mikva Challenge and Mumkin Studio will partner to kick-off a program for teen user experience design interns at Chi Hack Night. Four Chicago Public High School students will work with Chi Hack Night during the fall quarter. They’ll design, implement, and evaluate user experience for two Chi Hack Night projects. Petcokealerts.org supports advocacy groups on the southeast side in their fight against an environmental injustice. There is a lot of talk at Chi Hack Night right now about being inclusive. Truly including people means learning to appreciate the things they enjoy, the ways they express themselves, their style. If you don’t like the way women sound and socialize and approach professional life, maybe you…don’t really like women. On July 19th 2016, we heard from 9 members of Chi Hack Night on the projects they’ve worked on and the lessons they’ve learned from our community. Though there was no defined theme or coordination among the presenters, all 9 talks ended up focusing on the topics of empathy, inclusion and progress. Help us pass Chicago’s new recycling ordinance! After the launch of My Building Doesn’t Recycle, an improved recycling ordinance is up for debate in Chicago City Council on July 18th. Help get it passed by contacting your Alderman! Based on the success of the lightning talks we did for our 200th episode, we’re giving it another go on July 19th! Do you have an interesting or funny story to tell about Chi Hack Night? Want to show off that awesome civic project you’ve been working on? Now’s your chance to tell it to the world! Chicago is piloting an analytical model to enhance its Park District’s regular beach water quality inspection process. The model, which was built entirely by a team of volunteers from Chicago’s civic tech community, aims to predict which beaches may need to close based on likely E. Coli contamination. Chicago has some extremely treacherous sidewalks, curbs and cross ways that have the potential of doing great bodily injury to those with disabilities. To help with this problem, Steven Luker submitted an app to the Center for Neighborhood Technology Urban Sustainability App Competition this weekend to allow users to report, see, and route around bad sidewalks. It was a dark and stormy night. As I trudged through the downpour on the old steel bridge across the Chicago River, I was excited that we had finally reached a breakthrough. For months we had been developing the perfect formula, better than any government or nonprofit throughout the land, for using public data to rate nursing homes. April 12th, 2016 marked our 200th Chi Hack Night! From our humble beginnings on March 22nd, 2012 as 4 nerds sitting around a table eating macaroni, to this week with 130 people from across the city from all manner of backgrounds, skillsets and neighborhoods, we have come a long, long way. Here’s what happened at Chi Hack Night 200. In both his State of the Union and his remarks at #SXSW, Chicagoan and President Barack Obama stated that the most important office in a democracy was that of the Office of the Citizen. At Chi Hack Night, we’re privileged to be part of an active movement of people getting engaged in their communities through the use of technology. I’ve been attending Chicago Hack Night events for at least 2 years and I’m writing this article to help celebrate their 200th weekly gathering. This image is from May 29, 2016, where the Heartland Alliance presented information. You can see me in the middle, sitting by the wall. That’s my usual spot. Helps me see better. It was September 2012, and I was reading a description for the Reinventing Chicago event at CNT (Center for Neighborhood Technology) the following month. The cost was $100, which isn’t a huge amount of money, but not exactly pocket change, at least not for me. But just as I was about to enter my payment information, I noticed that hackathon participants could attend for free. Even though I had no idea what a hackathon was, I figured, it was a weekend. How bad could it be? I don’t code or design or project manage or map. I am a writer. And an improviser. And sometimes a marketer. And I read a lot of books. Despite that, I have felt so welcome. More importantly, I’ve realized how every problem is interdisciplinary and we need everyone on board—everyone from all backgrounds— to solve them. #200 Celebration: Congratulations from Cook County Government! Simona Rollinson, Cook County’s Chief Information Officer, offers her congratulations to Chi Hack Night and the broader civic tech ecosystem in Cook County. In addition to providing data and information, she hopes to strengthen the fabric of this community. A strong civic tech community is a public asset. April 12, 2016 will mark the 200th episode of Chi Hack Night. To celebrate this day, we want to hear from you, the members of Chi Hack Night, about what you’ve done with or learned from this group. You can participate in two ways: by doing a lightning talk or writing a blog post. On Feb 23rd 2016, Joel Inwood hosted a one-time breakout session at Chi Hack Night to discuss lean and feedback-centric methods of promoting your civic app. Three participants had their own project that needed some exposure, each of which is described below in the form of a case study that may provide some inspiration. We have generalized some guerilla marketing methods at the end that you should be able to apply to your own project. With the initial success of our open data pledge for Cook County State’s Attorney, Chi Hack Night is turning our attention to another important county race. We’re inviting every candidate for Cook County Clerk of the Circuit Court to sign a pledge to, if elected, commit their office to publish open data. Chi Hack Night is inviting every candidate for the Cook County State’s Attorney to sign a pledge to, if elected, commit their office to publish open data and attend Chi Hack Night on Feb 23rd, 2016. Adrienne Alexander came to Chi Hack Night last night to tell us about her experience as a lobbyist working for the state’s largest public employees union. The story of how the Laquan McDonald video got released thanks to one curious journalist and the Freedom of Information Act. It’s the end of the year, and time to reflect on all the amazing things we accomplished in 2015 at the Chi Hack Night, Chicago’s place to build, share and learn about civic tech. Our community has never been as large, as diverse, as engaged and as productive as it is now. We have a lot to be proud of. Chi Hack Night has been referenced as the largest, most successful and productive civic hacking community around. This post is my first attempt at synthesizing and sharing our organizing model, starting with 10 lessons we’ve learned over the years. 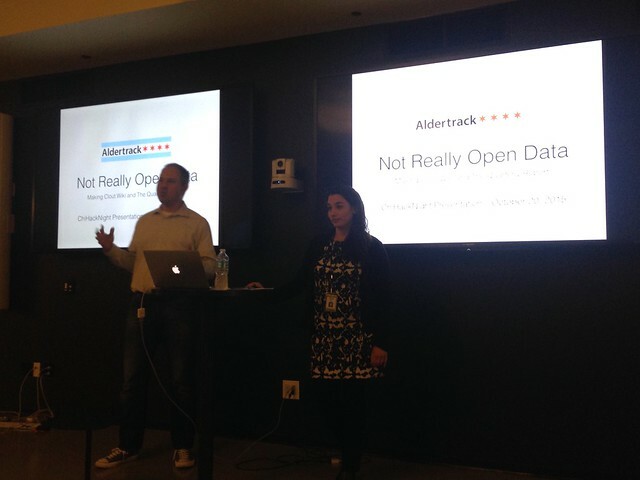 Mike Fourcher, founder of Aldertrack, and perpetual “news startup antagonist” (okay, I don’t remember the actual adjective he used), joined his colleague Claudia Morell, a reporter, and us at ChiHackNight on Tuesday night to explain how Aldertrack works. The CPS Tiers map doesn’t update automagically. I volunteer my time to keep it accurate and up to date, and it’s worth doing. Last week, for budget “season” in Chicago, Mayor Rahm Emanuel proposed privatizing the 311 system – where citizens and aldermen request services from any city department, and citizens get information about city services – as a way to pay for the technology upgrade the system desperately needs. The Chi Hack Night will be sending 13 members of our community to the Code for America Summit September 30th - October 2nd, 2015. We had everyone who went answer a few questions about themselves and what they’re looking forward to at this year’s Summit. We can’t wait to meet everyone there! Yesterday, the Chi Hack Night had our first ever community feedback session. The Chi Hack Night has grown and changed a lot over the last 3 ½ years, and we wanted to take the time and hear from everyone on how it’s going, and how we can make it better. To handle our large group (there were about 70 people in attendance), we broke out into four groups, led by Genevieve Nielsen, Rose Afriyie, Cathy Deng and Karl Fogel, to provide feedback on four topics. Email wasn’t just limiting our discussion quality and member inclusion, it was also limiting file storage, file sharing, and file versioning (which file is the latest?). Email has tended to demand a lot of attention, and there’s a lot of wasted time typing responses. I wanted to use a tool that didn’t have such demands, and that helped organize responses into actionable requests and delegation. I’m happy to announce the new name and logo for our event. Since we started 3 years and 155 events ago, our event has grown into a community all it’s own. We emerged out of the Open Government movement here in Chicago, and have become something much more. We’re not just about Open Gov anymore. We’re about Chicago. At Woodstock Institute, our mission is to advance economic justice, particularly for low-wealth communities and communities of color. To move towards this goal, we prepare data concerning economic justice and empower others to use and understand it. As our national partners at the National Community Reinvestment Coalition say, data drive the movement. The flourishing of the Civic Tech movement has brought techies and citizens together, using technology to make cities more transparent and better coordinated. The movement’s strength and joy is its diversity - Chicago’s Open Gov Hack Night attracts a wide range of talents and interests each week, from web designers to database managers, data scientists, designers, business intelligence professionals, journalists, government representatives, social science researchers, non-profits and community organizers. The Open Gov Hack Night is Chicago’s weekly event to build, share, and learn about civic tech. And, boy, was it ever a place to do just that in 2014. Looking back over the last calendar year, we did a lot - too much to recount in one blog post. But I can hit the highlights! One problem organizations have faced in the past when opening up their data is that, well, the data has to remain closed. For example, data with either HIPAA or FERPA provisions is pretty much stuck in a closed state. Furthermore, many organizations are reluctant to open up certain datasets. However, all hope is not lost - this post will advance the idea of Open Source, Closed Data and present several implementation strategies. Web scraping is the task of extracting data from a website. It’s a nifty skill in any technologist’s toolkit because interesting data isn’t always accessible via an API or in a table/csv - sometimes, interesting data is just sitting on a webpage. Nowadays, more and more folks are paying attention to civic tech, seeing potential at the intersection of civics & all things digital. Civic Tech Voices is a collaborative blogging experiment, of sorts, with the goal of amplifying more diverse perspectives & stories in civic tech.